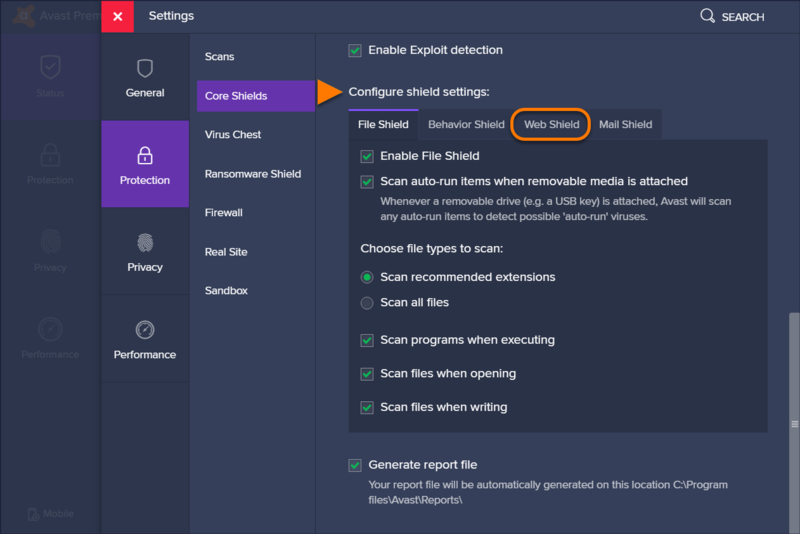 Core Shields are the main protection components in Avast Antivirus. The Core Shields are: File Shield, Behavior Shield, Web Shield, and Mail Shield. By default, all Core Shields are enabled to provide optional protection. 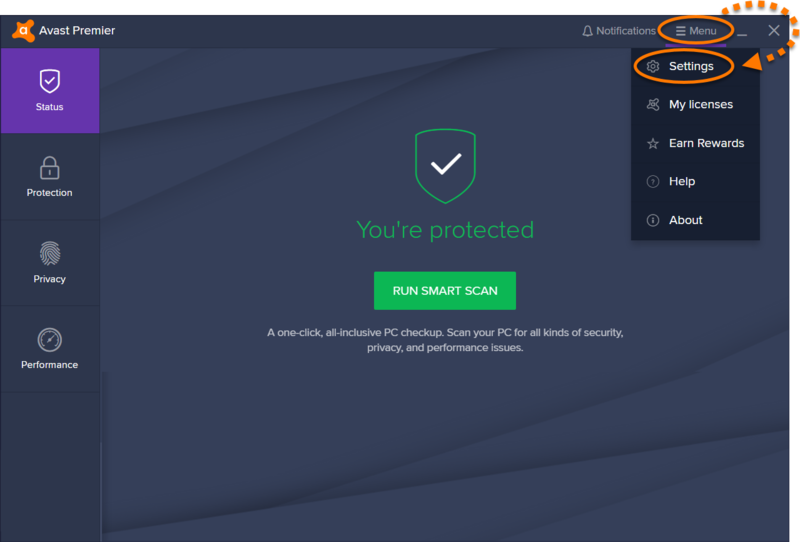 Avast Antivirus shields actively analyze suspicious information both sent from and received to your PC, as well as potentially malicious content stored within your PC. These components detect and block malicious files, dangerous websites, unauthorized connections, and other threats. Select Protection ▸ Core Shields. Click the slider so that it turns to red (OFF), and select the duration of time Core Shields will be disabled. All Core Shields are now temporarily disabled. To enable all Core Shields, follow steps 1-2 above, then click the red slider so that it changes to green (ON). Select action to be performed when a virus is found: this setting applies to Viruses, Potentially unwanted programs (PUPs), and Archived Viruses. We recommend selecting Fix automatically for all three types. Enable CyberCapture Technology: define how you want to treat a threat on your PC. You can select Always block a threat to allow Avast to block the threat automatically, or Ask me about decision to receive a notification every time a threat is detected on your PC. Enable Hardened Mode: uses information based on reputation services to determine which executable files are safe to open. Enable Rootkit detection: enables Avast to monitor hidden malicious threats in the system. Unticking this option may resolve potential compatibility issues that can cause system crashes. 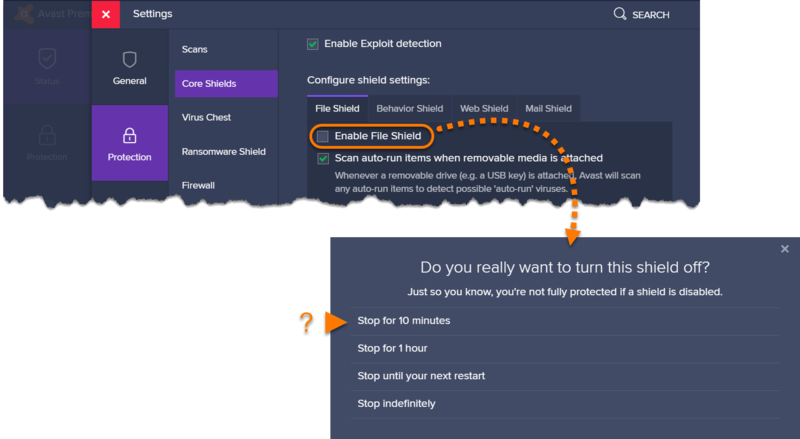 Enable Exploit detection: enables Avast to detect and block attempts to run malicious threats or processes in the memory from exploiting vulnerable applications on your PC. Unticking this option may result in potential compatibility issues that can cause system crashes. Untick the box next to Enable File Shield to disable File Shield and select the duration of time File Shield should be disabled. Tick the box next to Enable File Shield to enable File Shield. Untick the box next to Enable Behavior Shield to disable Behavior Shield and and select the duration of time Behavior Shield should be disabled. Tick the box next to Enable Behavior Shield to enable Behavior Shield. Untick the box next to Enable Web Shield to disable Web shield and select the duration of time Web Shield should be disabled. Tick the box next to Enable Web Shield to enable Web Shield. Untick the box next to Enable Mail Shield to disable Mail Shield and select the duration of time Web Shield should be disabled. 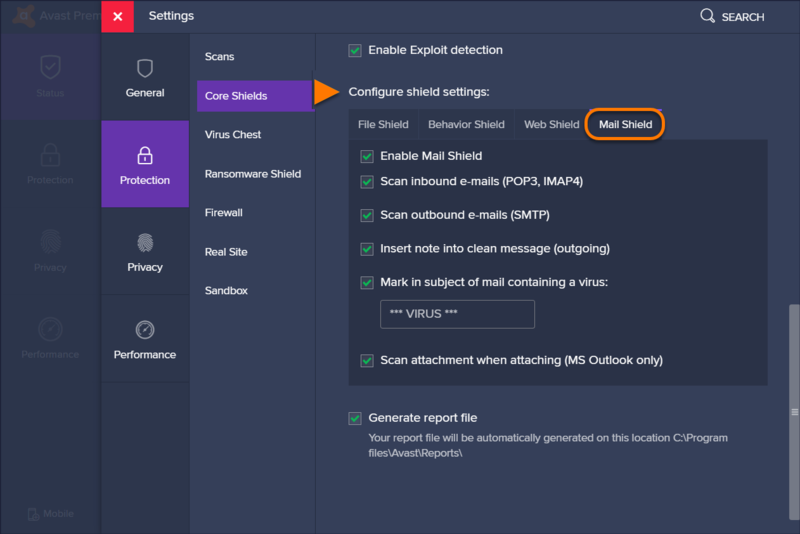 Tick the box next to Enable Mail Shield to enable Mail Shield. You can also enable/disable all Core Shields, Firewall, and Real Site at once from the system tray. Right-click the Avast system tray icon and select Avast shields control, then select an action from the context menu. We strongly recommend you keep all crucial security components, such as Antivirus shields and Firewall, enabled to ensure your maximum protection. We do not recommend turning off these components indefinitely by selecting the Stop permanently or Disable permanently options. File System Shield actively scans all programs and files on your hard drive as they are opened, run, modified, and saved. If malware is detected, File System Shield prevents the program or file from infecting your PC. Enable File Shield: turn File Shield on or off. Scan auto-run items when removable media is attached: specify whether you want File System Shield to scan removable drives for auto-run viruses. Scan recommended extensions: specify if File Shield should scan all files or only those recommended by Avast. Scan when executing: specify whether you want File System Shield to scan programs, scripts, or libraries each time they are run. Scan when opening: specify which file types you want File System Shield to scan each time the files are opened. Scan when writing: specify the file types you want File System Shield to scan while the files are being created or modified. Generate report file: specify whether you want File System Shield to produce reports of scan results. Behavior Shield monitors programs installed on your PC for suspicious behavior that may indicate the presence of malicious code. Enable Behavior Shield: turn Behavior Shield on or off. Generate report file: specify whether you want Behavior Shield to produce reports of scan results. Web Shield actively scans data that is transferred when you browse the internet to prevent malware from being downloaded and run on your PC. 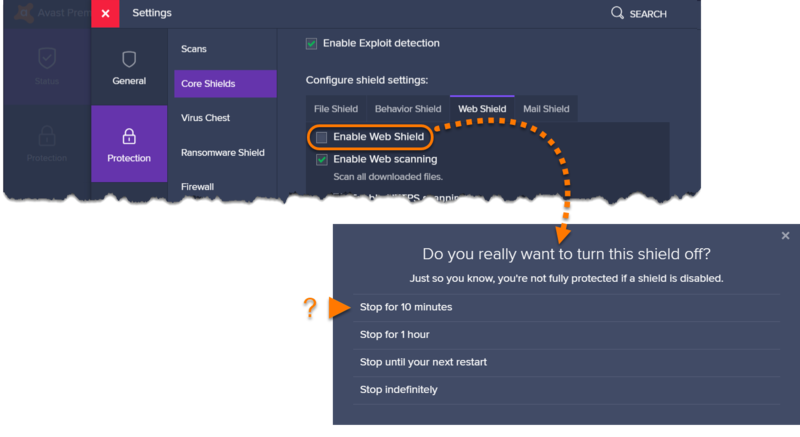 Enable Web Shield: turn Web Shield on or off. Enable Web scanning: specify if Web Shield should scan all downloaded files. Enable HTTPS scanning: specify if Web shield should scan encrypted websites. Enable Script scanning: specify if Web Shield should block malicious scripts from applications and websites. This includes remote threats from the web and outside sources, and local threats saved to disk or in the browser cache. Script scanning can also detect and block malicious scripts that come from HTTPS (encrypted) connections. Enable site blocking: allows you to block access to specific websites. Click Show Blocked Websites and type the website address to add a website to the list. Then, click +Add Website to add another website to the list, or Close to confirm the addition and return to Web Shield settings. Generate report file: specify whether you want Web Shield to produce reports of scan results. 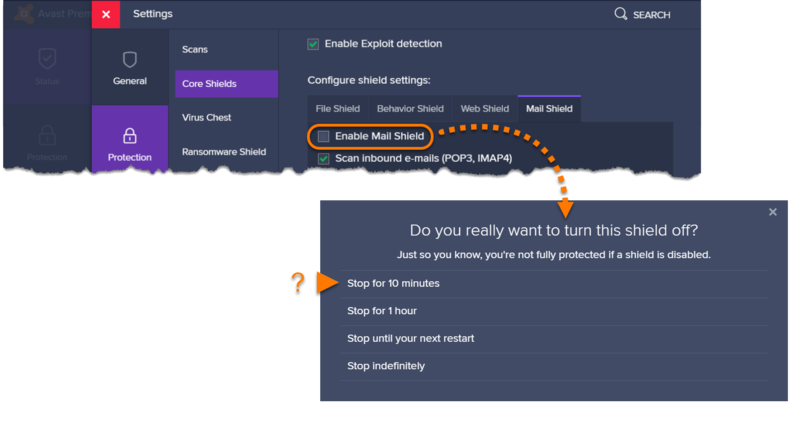 Scan inbound e-mails (POP3, IMAP4): specify if Mail Shield should scan all incoming emails sent using an SSL/TLS encrypted connection. Scan outbound e-mails (SMTP): specify if Mail Shield should scan all outbound emails sent using an SSL/TLS encrypted connection.